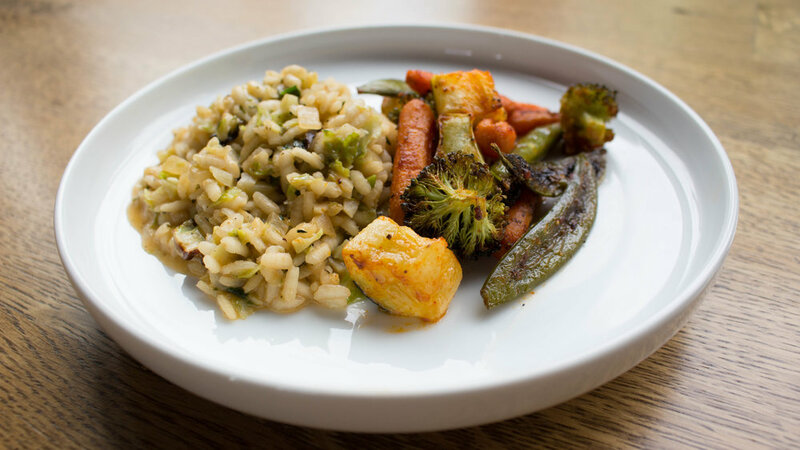 Brussels Sprouts Risotto w/ Roasted Veggies — Happy Food Co.
*If the oil has solidified in the fridge, place the sealed packets in a cup of warm water. It will return to a liquid. ARRANGE the mixed seasonal veggies (except the brussel sprouts) on a baking sheet. DRIZZLE with extra olive oil and gochujang sauce, and season to taste with salt and pepper. Toss gently to combine. MELT 2 butter balls in a large, deep skillet over medium heat. ADD the chopped onion and shredded brussels sprouts. Sauté until just soft. WARM sunflower oil in a small skillet over high heat. ADD the tiny brussels sprouts and sauté until golden brown, about 5 minutes. Be careful of splattering! DRAIN excess oil and season to taste with salt and pepper. Step 5: Combine the Risotto Ingredients, Serve & Enjoy! STIR the remaining butter balls into the hot rice mixture. ADD the brussels sprouts, parmesan, lemon juice, chopped tarragon and gorgonzola crumbles, stirring until melted and combined. NOW high-five yourself and please, for the love of everything good and right with the world, sit down, relax and enjoy what you just made. Or hey, just tell us if you don’t enjoy it, because we think it’s great and want our customers to think so too. A refreshingly dry rosé with flavors of fresh strawberry, raspberry and citrus, with hints of minerality and floral notes that provides a bright, crisp finish.